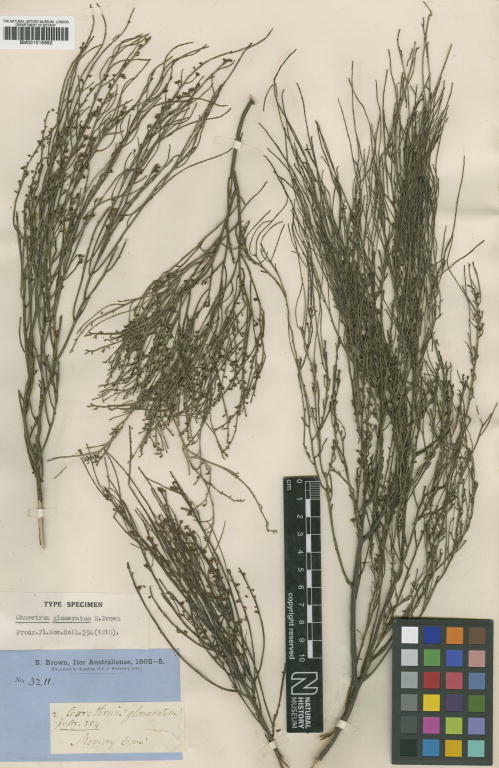 The State Herbarium has chosen Choretrum glomeratum R. Br. (common sour bush), as Plant of the Month for April 2016. It is found across southern South Australia and in Lincoln National Park, the Department of Environment, Water and Natural Resources‘ Park of the Month. Choretrum glomeratum was first collected at Memory Cove by Robert Brown, between the 22–25 of February 1802. This became the type collection of the species and was made just after Matthew Flinders’ voyage had lost a cutter and its crew. This collection was later illustrated by Ferdinand Bauer for Endlicher‘s Iconographia generum plantarum (plate 45). Acacia alcockii was also collected at the same time and was annotated by Brown as “Mimosa no. 2”, but this collection did not become a type and was later mistakenly identified as Acacia retinodes. The botanical legacy of Flinders’ expedition is discussed in detail in this article (28MB PDF) by State Herbarium Hon. Research Associate Robyn Barker. Choretrum glomeratum grows into a many stemmed shrub 1–2 m high. Its erect branches with winged leaf bases and small leaves up to 3 mm long have a distinct pale yellow/green colour. The small white flowers occur throughout the year but are most obvious in late summer and autumn, fruit is a round ridged fleshy drupe that would probably benefit from passage through a gut for germination. A member of Santalaceae (3.6MB Flora of South Australia PDF), the 7 species of Choretrum restricted to Australia are parasitic on the roots of other plants, much like the better known quondong (Santalum acuminatum), sandalwood (Santalum spicatum) and native cherry (Exocarpos cupressiformis). Choretrum glomeratum and some of its close relatives are part of a fascinating interaction between Camponotus ants (see Guide to Camponotus ants of Australia published by the SA Museum) and Ogyris otanes butterflies. Chewed branch ends on the shrub indicate the presence of the butterfly’s caterpillars that live in the ant’s nest and are escorted to and from the plant by the ants. Similar associations also occur with this group of blue butterflies and ants on mistletoes. The decline of plant numbers through habitat fragmentation and inappropriate fire regimes also impacts the butterfly population. This entry was posted in The Plant Press on 4 April, 2016 by Jürgen.